File Name: Brian M. Forrest of Myrtle Beach, South Carolina. Notes: Filecards from 2001 onward list the middle initial as C. Myrtle Beach is on the north end of the state's Atlantic coast, about 95 miles northeast of Charleston. 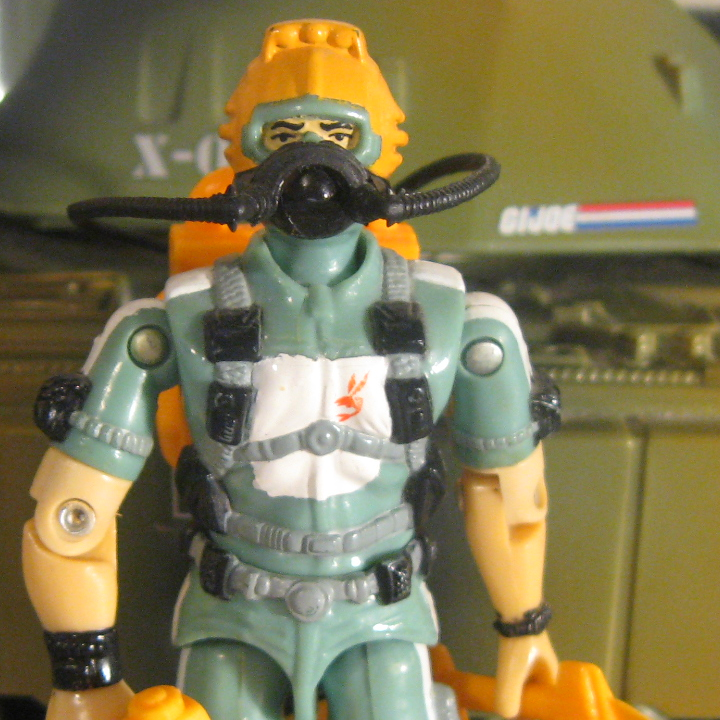 Sunbow's Wet-Suit wore his first 1986 outfit, almost always without the helmet unless underwater. He had curly brown hair, his backpack sported propellers, and he carried a normal flashlight in place of the sled. In at least four episodes, he was occasionally drawn with the generic yellow frogsuit worn by other Joes, sometimes changing from one uniform to the other from shot to shot. The series paired him with Leatherneck, and the two would constantly trade insults related to their respective branches of service. Wet-Suit's file name is mentioned in the episode Ninja Holiday. The DiC series used the 1992 outfit, again without the sled. In the Valor vs. Venom film, his outfit most closely resembled the first 2002 version. Keyboard Warriors 173 seconds 16 lines interrogating Overkill, flying Battle Copter, fighting android shark, in Glider to assault A.S.P. Accessories: black pair of flippers (85 Eel's), orange scuba backpack with holes for air hose (new), orange soft searchlight with loop under handle (new), orange sea sled with side fins and handle (new), black U-shaped breather with air hoses (new). Seals are the guys who were too nasty to be Airborne Rangers or Marines. The Navy keeps their S.E.A.L.s locked up below decks until something bad becomes worse. That's when they all get dumped in the soup on a rubber raft with a knife, a gun, and all the ammo and explosives they can carry. Wet-Suit may just as well be the roughest one of the bunch. He's wild and unruly - but he's simply the best at what he does. "Wet-Suit may be mean to the bone, but he's also quite bright, being well-read in both the classics and the standard texts of military tactics. Pretty amazing considering that the level to which he has developed his toughness would seem to indicate full-time occupation..."
Toy Notes: Featured in 1986's Devilfish commercial. Item #6470. Accessories: black pair of flippers (85 Eel's), orange backpack (86 Wet-Suit's), orange searchlight (86 Wet-Suit's), orange sea sled (86 Wet-Suit's), black breather (86 Wet-Suit's). Toy Notes: Boxed in a Toys 'R Us-exclusive set with Claymore, Dial-Tone, Leatherneck, Mainframe, and an audio cassette. Item #6691. S.E.A.L. (Sea, Air, and Land) MOS 1: S.E.A.L. Accessories: yellow "hydro-charged spear rifle" with fin-shaped stock (new), black spring missile-launching "nautical jet sled" with yellow trigger (new), three orange spring missiles, widening near tip, with slot to mount on sled (new), yellow full-head underwater helmet with cut-out for eyes (new), yellow pair of flippers with curved toe and ridge down middle (new), black figure stand (common). WET-SUIT has been characterized as being "175 pounds of mean on the hoof" and is definitely not known for his social graces. He is not the type who goes over very well at the Chaplain Assistants' Social Tea, but he is exactly the dude you want behind you when you run into a gaggle of Cobra EELS in a shallow mine field. Amazing how much damage he can do with a Ka-Bar knife and a weighted belt. Wet-Suit is the head-honcho in charge of piloting the G.I. Joe Barracuda. Motto: "Well, with all due respect, nobody told me NOT to blow it up, SIR!" 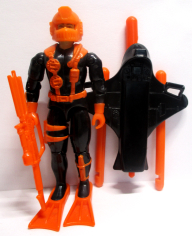 Accessories: orange spear rifle (92 Wet-Suit's), black hydro-sled with yellow trigger (92 Wet-Suit's), three orange missiles (92 Wet-Suit's), orange helmet (92 Wet-Suit's), orange pair of flippers (92 Wet-Suit's), black figure stand (common). Navy S.E.A.L. MOS 1: Navy S.E.A.L. Accessories: black backpack (86 Wet-Suit's), black sea sled (86 Wet-Suit's), black breather (86 Wet-Suit's), black figure stand (common). It is said that S.E.A.L.s are the guys who were too nasty to be Airborne Rangers or Marines. That certainly qualifies in the case of Wet-Suit. The man is a walking attitude. Fortunately, he's not a walking attitude PROBLEM like Shipwreck, but Wet-Suit is almost as hard to keep in line. The problem may lie in the fact that he loves his work a little too much. His specialty is underwater demolitions, and he tends to use too heavy a hand when asked to blow up something. The last COBRA base he took out - a floating fortress - got blasted into so many pieces that there wasn't enough left to sink. From General Hawk's Files: "Wet-Suit is wild and unruly, exactly the opposite of the unit's commander, Torpedo, but he's not as obnoxious as Shipwreck. He's also much more intelligent than he comes across. I just wish he'd exercise more caution in his work. We could really use a little more evidence of COBRA's oceanic operations for evaluation than inch-wide pieces of metal and plastic." Motto: "With all due respect, sir, no one told me NOT to blow it up!" Toy Notes: Carded in a Toys 'R Us-exclusive Navy Assault Unit three-pack with Shipwreck and Torpedo. Item #57066. Accessories: black pair of flippers (85 Eel's), grey backpack (86 Wet-Suit's), grey searchlight (86 Wet-Suit's), grey sea sled (86 Wet-Suit's), black breather (86 Wet-Suit's), black figure stand (common). He's smart as a whip, quick as a deer, and mean to the bone. Best to stay out of his way, even on a good day. Probably the reason why he's a S.E.A.L. - he has the personality of a wet fish. No wonder the Navy keeps their S.E.A.L.S locked up below decks until something bad becomes worse. That's when they're in their element and they all get dumped in the soup on a rubber raft with a knife, a gun, and all the ammo and explosives they can carry. Doesn't matter how fast their target is moving - they get it every time. Wet-Suit may just be the roughest, and most precise, one of the bunch. Even the most frightful sea creatures run for cover when Wet-Suit hits their turf. He's wild and unruly - but he's simply the best at what he does. Toy Notes: Carded in a two-pack with Wet Down. Item #53043. Navy S.E.A.L. MOS 1: S.E.A.L. Accessories: silver speargun (83 Torpedo's), black scuba helmet with silver breather and crest (new), black pair of sandal-style three-toed flippers (new), black backpack (83 Torpedo's), grey searchlight (86 Wet-Suit's). WET-SUIT has been called "the nastiest combination of shark, eel, and stingray that you can think of." He was trained as a S.E.A.L., the toughest training in the Navy, and is an expert in marine operations and demolitions. He is not known for his social graces - you wouldn't catch him chatting with guys in three-piece suits about the latest Broadway play, but when you need someone who can take out a COBRA underwater base with just some fishing line and a knife, then he's your guy. In the Atlantis Battle, he stormed Cobra Island and destroyed a marine assault plan that COBRA MORAY had been planning for years. because of that, he is now the top target for COBRA MORAY's next attack. "Just give me the target and get me under the waves so I can stop those slimy buckets of fishbait!" Toy Notes: Carded in a two-pack with Cobra Moray. Item #53133. Accessories: silver speargun (83 Torpedo's), green helmet with silver breather and crest (02 Wet-Suit's), green pair of flippers (02 Wet-Suit's), black backpack (83 Torpedo's), grey searchlight (86 Wet-Suit's). Accessories: silver machine gun (87 Tunnel Rat's, with Sound Attack tab), silver flare gun (90 Stretcher's), black backpack (92 Gung-Ho's). WET-SUIT has been called "the nastiest combination of shark, eel, and stingray that you can think of." He was trained as a S.E.A.L., the toughest training in the Navy, and is an expert in marine operations and demolitions. He is not known for his social graces - you wouldn't catch him chatting with guys in three-piece suits about the latest Broadway play, but when you need someone who can take out a COBRA underwater base with just some fishing line and a knife, then he's your guy. Toy Notes: Boxed in a B.J. 's-exclusive set with Dial-Tone, Roadblock, Snake Eyes, Fast Blast Viper, Firefly, Storm Shadow, and Undertow. Item #53227. WET-SUIT has been called "the nastiest combination of shark, eel, and stingray that you can think of." He was trained as a S.E.A.L., the toughest training in the Navy, and is an expert in marine operations and demolitions. He is not known for his social graces - you wouldn't catch him chatting with guys in three-piece suits about the latest Broadway play, but when you need someone who can take out a COBRA underwater base with just some fishing line and a knife, he's your guy. With the new DEPTH RAY submarine, WET-SUIT can now take his S.E.A.L. skills onto the land as well. Reconfiguring into the SPY TROOPS dune buggy mode, the G.I. JOE team now has a fast, effective sea/land strike craft. "COBRA forces are nastier than a week-old bucket of chum, but guess what? They're in my territory now and no evil goes down on my watch."